Chain driven roller conveyors and chain conveyors are used when moving large heavy loads such as pallets, drums, bales etc. This range of conveyor can handle product up to nominally 2000kgs depending on the type and size of the load. They are also used in Chill or Cold stores where a stainless steel version is utilised which uses special low temperature components. Accumulation can be achieved using 'state of the art" electronics, accumulation intelligence and performance rollers to deliver any specific requirement. Conveyor Systems Ltd can custom build a chain driven live roller conveyor system for any application - speed, number of stops, decision points, transfer positions, etc. Triple Chain Conveyor These conveyors offer long distance straight-line transportation for pallets that may not travel comfortably on rollers e.g. euro pallets, cages, etc. Chain conveyors can also be supplied in modules to create accumulation and are almost silent in operation and can interface with and transfer to other pallet modules, allowing changes in direction to be made. 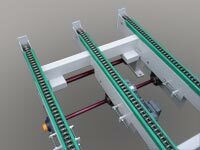 Chain conveyors can be 2-strand or 3-strand or for larger applications, they can be multi-strand but are still capable of providing accumulating where required. 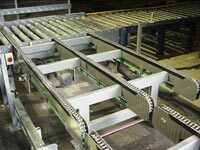 Chain driven live roller conveyors and chain conveyors are available in a variety of conveyor widths, roller pitches and roller diameters to suit the load requirement and throughputs.